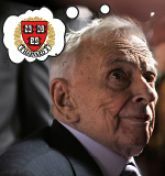 “I graduated from [Phillips] Exeter,” he explained, “and I was aimed at going to Harvard. Instead I enlisted in [the Navy] in 1943. When I got out, in ’46, I thought, ‘I’ve spent all my life in institutions that I loathe, including my service in the [Navy] of the United States.’ I thought, ‘Shall I go for another four years?’ . . . … continued at Inside Higher Ed., HERE.